The behaviour of racquets and balls is governed mainly by Newton’s three Laws of Tennis. These laws are fully explained in our book The Physics and Technology of Tennis. The following is a summary of a few topics of interest to give you a flavour of how physics relates to sport and to the real world of everyday objects. A tennis racquet, like a baseball or cricket bat, has a sweet spot. If a ball impacts at the sweet spot, the force transmitted to the hand is sufficiently small that the player is almost unaware that the impact has occured. If the ball impacts at a point well away from the sweet spot, the player will feel some jarring and vibration of the handle. The sweet spot is a vibration node, located near the centre of the strings. Another potential sweet spot is the centre of percussion (COP). These and some other significant spots on a racquet are shown below. Contrary to popular opinion, the sweet spot does not coincide with the point at which the ball rebounds with maximum speed, nor does it locate the spot where the force on the hand is zero. Forces on the hand arise from three independent motions of the handle, namely rotation, translation and vibration. 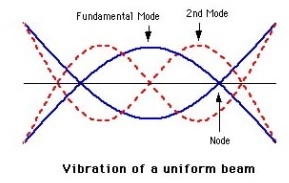 The vibrational component is absent when a ball strikes the vibration node. The rotational component, arising from recoil of the racquet head, exerts a torque on the hand, causing it rotate about an axis through the wrist. As a result, a force is always exerted on the upper part of the hand, and a force in the opposite direction is always exerted on the lower part of the hand. The COP shown in the diagram above is located close to the node point when the racquet is freely suspended, but it shifts into the throat area of the racquet when the racquet is held in the hand. Consequently, the COP shown in the diagram is NOT the sweet spot that players talk about. 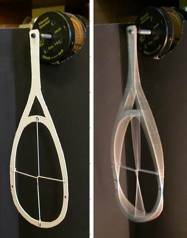 The first two vibration modes of a freely suspended tennis racquet are shown below. 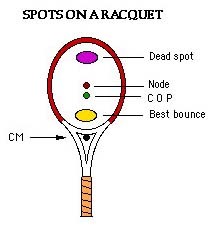 A racquet behaves like a uniform beam in this respect, despite its round head, since the centre of mass of a racquet is near the centre of the racquet. The fundamental mode has a frequency of about 100 Hz for a relatively flexible frame or about 180 Hz for a stiff frame. One node is near the centre of the strings, and the other node is in the handle. It is easy to hear this vibration if you hold the handle lightly at the node in the handle, with the handle near your ear, then strike the frame or strings. The vibration node on the strings is easily located using this technique. If you hold the handle firmly, the frame vibrations (but not the string vibrations) are strongly damped. The next mode, for a uniform beam, has a frequency 2.75 times the fundamental frequency. It is not excited with any significant amplitude since the impact duration, T, of the ball on the strings is about 5 ms. 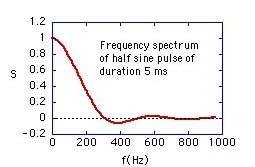 The frequency spectrum of this pulse, approximately a half sine waveform, peaks at zero frequency and is zero at f = 1.5/T = 300 Hz , close to the second mode frequency. The impact will still excite string vibrations at about 500 Hz since the strings are not as strongly damped as the frame. 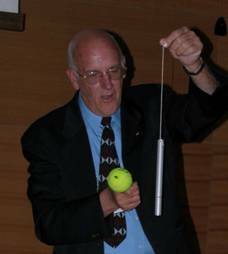 A metal tube will vibrate nicely when struck with a metal rod, but it does not vibrate when struck with a tennis ball. How come? The impact duration, about 0.005 sec, is too long to excite any vibration with a period shorter than about 0.002 sec, especially if the tube is struck at the fundamental vibration node (its sweet spot). The vibration of a racquet is usually too small to see by eye, but a cardboard racquet vibrates the same way and shows the vibration modes clearly (see photo below). The top end was vibrated back and forth by about 1 mm at a frequency of about 30 Hz. The nodes in the frame and in the two strings are easily seen. The photo on the left is with the vibration generator switched off. The vibration frequency of a racquet depends on the stiffness of the frame. This is one way of determining whether you are using a stiff or a flexible racquet. A stiff racquet vibrates at 180 Hz or more. A flexible racquet vibrates at 140 Hz or less. QuickTime sound files for a racquet held near the ear and tapped by finger or by a ball near the tip are attached for frequencies of 120, 140, 160, 180, 200 and 220 Hz. These sounds are too low in frequency to be heard properly using the internal speakers of a computer. You will hear only some metallic clicks when the racquet is struck. Internal speakers usually have almost no bass response. You will need to connect external speakers, with fresh batteries if they are battery operated. The best way to feel a racquet vibrate is to hit a ball on the tennis court. What is it that you “feel”? Does it feel good or bad? Why do different racquets feel different? Does a $400 racquet feel a lot better than a $100 racquet, and if so in what way does it feel better? These are not easy questions to answer. I have never heard a good explanation or description in terms of the physics of feel. Players say that some racquets feel more powerful than others, but how do they know unless they measure the ball speed, which they don’t? Can you feel the difference between a 140 Hz vibration and a 160 Hz vibration? One way to test this is to put your hand on the speaker used to play the sound files. It will help to use an external speaker rather than the inbuilt speaker in your computer. You can feel a thump every time the racquet is hit but that’s because you can easily feel the change in amplitude (or size) of the vibration. I find that high frequencies tickle my hand more than low frequencies, especially if the soft part of the palm of my hand rests gently on the speaker. Consider a racquet that is freely suspended by a long length of string or balanced vertically on the end of its handle. If a ball impacts at the centre of mass (CM), the racquet will recoil at a speed V. All parts of the racquet will recoil at the same speed V. If the ball impacts at any other point on the strings, the racquet will recoil and it will also rotate about its CM. The whole racquet then moves away from the ball with a speed V1 due to the recoil , but the handle simultaneously moves towards the ball with speed V2 due to rotation of the racquet. If there is any point in the handle where V1 = V2, then that point will remain stationary and the rest of the racquet will rotate about that point as shown below. 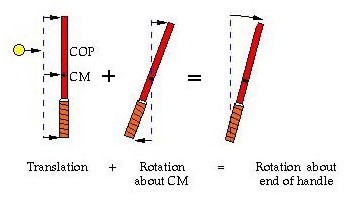 The axis of rotation is called the conjugate point with respect to the impact point, and the impact point is called the centre of percussion (COP) for that particular axis of rotation. The axis and the COP form a pair of conjugate points. For an impact near the tip of the racquet, the axis of rotation is about half way between the end of the handle and the CM. For an impact near the throat of the racquet, the axis of rotation is beyond the end of the handle. Now consider a racquet that is suspended by a rod passing through a hole drilled through the handle so that the racquet can rotate freely about this axis when a ball strikes the strings. When a ball impacts on the strings, the handle will exert a force on the axis unless the ball impacts at the COP. Consequently, the COP is often regarded as a second sweet spot since the force on the hand should be zero for an impact at the COP. However, the hand adds an additional mass of about 500 gram to the handle, and it shifts the location of the COP to a position near the throat area of the racquet. The details of this effect are described in an Am J. Phys article that you can download here. Clamp the end of the handle on a table, using your hand to press on the handle, so the rest of the racquet hangs over the edge of the table. Then drop a ball onto the strings at various points. The ball will bounce best near the throat. There is a spot near the tip where the ball doesn't bounce at all. That's the dead spot. At the dead spot, all of the energy of the ball is given to the racquet, and the racquet does not give any energy back to the ball. The reason is that the effective mass of the racquet at that point is equal to the mass of the ball. The effective mass is the ratio of the force at that point to the acceleration at that point (F = ma so m = F/a). If a ball of mass m collides head-on with another ball of mass m at rest, then the incident ball stops dead and gives all its energy to the other ball. Similarly, if a moving racquet strikes a stationary ball at the dead spot, then all the rotational energy of the racquet is given to the ball. A good place to hit a ball when serving is near the dead spot. However, when returning a fast serve, the dead spot is the worst place to hit the ball. The best spot is nearer the throat of the racquet since that's where the ball bounces best. The rules of tennis specify that the ball must bounce to a height between 53 and 58 inches when dropped from a height of 100 inches onto a concrete slab. What happens in actual play is hard to predict, but a good test is to drop a ball onto the strings when the head is clamped (eg by placing the racquet on the floor and stepping on the handle near the head). When dropped from a height of say 1 metre, the ball will bounce to a height of about 0.70 metre. The ball loses about 45% of its energy when dropped on concrete, but it loses only 30% of its energy when dropped on the strings. That's because the strings absorb some of the impact energy and then give almost all of that back to the ball. The amount of energy lost by the ball depends on its compression. When dropped from 100 inches on concrete, it compresses by about 6 mm. When dropped on the strings, it compresses by about 3 mm. The bigger the compression, the more energy is lost when the ball expands back to its original shape. That means that at high impact speeds, where the ball compresses more, the energy loss is even greater. Furthermore, the fraction of the ball's energy that is lost also increases as the the ball's energy is increased or as the compression is increased. The modern game of tennis is dominated by the amount of spin that players can impart to the ball. The change from small 9 inch heads in wood racquets to large 10.5 inch heads in graphite racquets allowed players to hit with more topspin since the ball was less likely to clip the frame. This also allowed players to hit the ball harder since balls hit with topspin dive down more sharply onto the court after they clear the net. By hitting the ball harder, players generated even more topspin, which allowed them to hit the ball even harder. The modern game is played at a much faster pace than in the wood racquet era, not because modern racquets or players are more powerful but because racquet heads are now an inch or two wider, allowing players to hit the ball with much more topspin. To extract as much topspin as possible from a stroke, players have learnt to swing up at the ball and to tilt the racquet head forward, That way, a ball coming off the court with topspin can be returned with topspin. The spin direction must be reversed to achieve this result. Two QuickTime movie files are attached showing how this is done, one by myself and one by Federer. The physics of each shot is the same, the only real difference being that Federer has a more elegant style. The film of Federer was taken at about 1000 frames/sec judging by the fact that the ball sits on the strings for about 5ms and is seen for 4 or 5 frames on the strings. The amount of spin depends on a whole bunch of factors, including the speed, spin and angle of the incident ball, the speed, approach angle and tilt of the racquet, the type of string etc. If the ball is rising at the same speed as the racquet, then no topspin will be generated, as shown in this movie clip, since the racquet does not brush upwards against the back of the ball. It is clear from this result that more topspin will be generated if the player strikes the ball while the ball is falling, rather than when the incoming ball is rising. 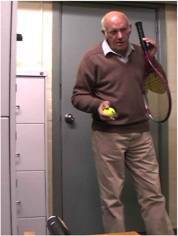 I often get requests from students wanting ideas for experiments or projects relating to the physics of tennis. I have prepared a few PowerPoint presentations on this subject, including some of the basic physics behind each experiment. They can be viewed directly on the web or downloaded as .ppt files. This page also contains some movies concerning various tennis experiments. Brody, H. (1979) Physics of the tennis racket. American Journal of Physics 47, 482-487. Brody, H. (1981) Physics of the tennis racket II: The sweet spot. American Journal of Physics, 49, 816-819. Brody, H. (1987) Tennis Science for Tennis Players, University of Pennsylvania Press. Brody, H. (1995) How would a physicist design a tennis racket?. Physics Today, 48, 26-31. 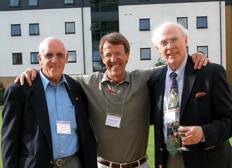 Rod Cross, Crawford Lindsey and Howard Brody at the TST2003 Tennis Conference organised by the International Tennis Federation in London. A brief article about Howard appears here.